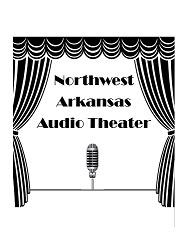 On the first weekend of June, 2017, Northwest Arkansas Audio Theater will present "Westward the Women" at the ACO. It is a rugged, gritty, sad, and funny tale based on a story by Frank Capra, mastermind of "It's a Wonderful Life". "Westward the Women" brings together American men who have settled in California just after the Gold Rush with American women from back East who want to better their lives as wives, and are willing to brave danger and misery to do it. Auditions will be held at the ACO at 7 P.M. on Tuesday and Wednesday, March 28 and 29, 2017. Characters include about seven male and ten female named roles, plus crowds of men and women. The leading lady speaks English with a French accent, and in French when her temper flares. One of the men is Japanese. If needed, we will coach the right people. As much as possible, we will be doing our own live sound effects, and some not-complicated singing - including our own original commercials. If you can play guitar, fiddle, banjo, or harmonica, bring it on! See you at auditions.